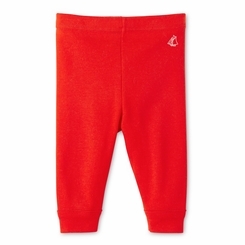 These baby girl leggings made in plain 1x1 rib are a collection basic. You can combine these practical leggings with dresses from the collection or with a blouse for a bodysuit for a more casual look. Note the silkscreened sailboat at the top of the leggings. 100% cotton.